The Yamaha THR10 combo amp packs in everything you need from an off-stage amp. Real tube amp tone and dynamics, great sound at low volume, genuine hi-fi quality stereo playback and full recording capabilities. Developed by a team of guitarists in search of the ultimate tone, the THR10 combo delivers the sound you want and the feeling you need. Effects that enhance and complement your playing combine with room-filling reverbs and delays to push your playing to new levels. 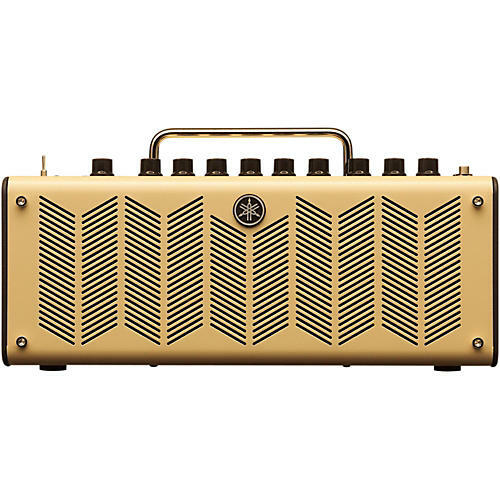 And thanks to THR's unique design and focus, stadium-filling volume isn't a pre-requisite - everything about this amp is designed to fit the way you play, right down to the need to keep it quiet sometimes. With tone and feel like this, you'll appreciate the ability to keep playing all night. Most of THR's effects feature VCM (Virtual Circuitry Modeling) effects processors. Based on the technology used in Yamaha's professional audio mixers, VCM effects give unsurpassed realism and quality. VCM effects are capable of capturing subtleties that simple digital simulations cannot even approach, going beyond simple simulation and delivering the truly musical performance that makes classic analog gear invaluable even in today's digital production environment. The THR10 was developed with Yamaha's award-winning AV division to offer true hi-fi stereo sound and a new experience in guitar amplifiers. The exclusive, specially designed speaker enclosure is optimized to handle both guitar and stereo playback sounds making it uniquely capable of giving you amazing tone for both your guitar and your track from a compact, portable amp. The THR10 incorporates Yamaha's new Extended Stereo Technology to create an incredibly wide, spacious audio image. Stereo tracks and studio quality reverb take on a depth unimaginable from such a small enclosure. Also bundled with Cubase AI, Steinberg's professional music production application it offers full-fledged recording and editing. The THR Editor offers deep editing of amp and effect parameters using your computer. Additional in-depth controls include compressor and noise gate functions. THR's design provides stereo playback from your smartphone or other device through its AUX jack or direct from your computer via the USB connection. The user memory function lets you save up to five amp settings of all controller and switch settings for quick recall. The tap tempo function allows you to quickly set delay time. A built-in chromatic tuner features accurate, stable tuning and an easy to read display. Finally, the THR10's Virtual Tube Illumination includes a simulated orange tube glow from the metal speaker grille. Start playing anywhere, anytime, now. Call or click to order.